So I've never been a veggie expert or cheerleader, but I've been trying to eat better for the last few years, and especially the last few months. I think of Michael Pollan's mantra whenever I go shopping, which goes something like this: eat everything, not too much, mostly greens. 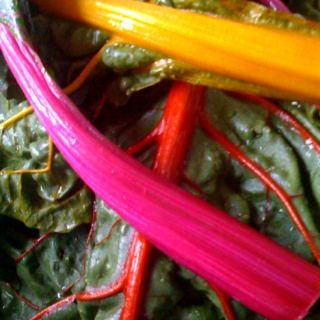 So I bought us some rainbow chard, and it was just beautiful! Here's how I prepared them, using a recipe I found on the Kitchn blog: Sauteed mushrooms, onions; set aside. Separated chard leaves from stems, then chopped leaves into smaller pieces. Blanched leaves in salted water, with red chili flakes in it, then drained leaves, mixed with mushrooms, onions. Then added half cup of breadcrumbs, half cup grated jack cheese, and three beaten eggs. Salt and pepper in mix, then bake for 25 min at 350. Comes out like a casserole--delicious way to get some greens in you! Next, I'm turning to the Kitchn blog again for a chard stems recipe--basically baked with parmesan cheese...I will report on the outcome!